27205 Farrow Court, Salvo, NC.| MLS# 102638 | Outer Banks Homes For Sale, North Carolina Home Search Including Nags Head, Pirates Cove, Manteo, Kill Devil Hills Kitty Hawk, Southern Shores, Duck, and Corolla North Carolina, Oceanfront and Soundfront properties for sale and long term rentals. 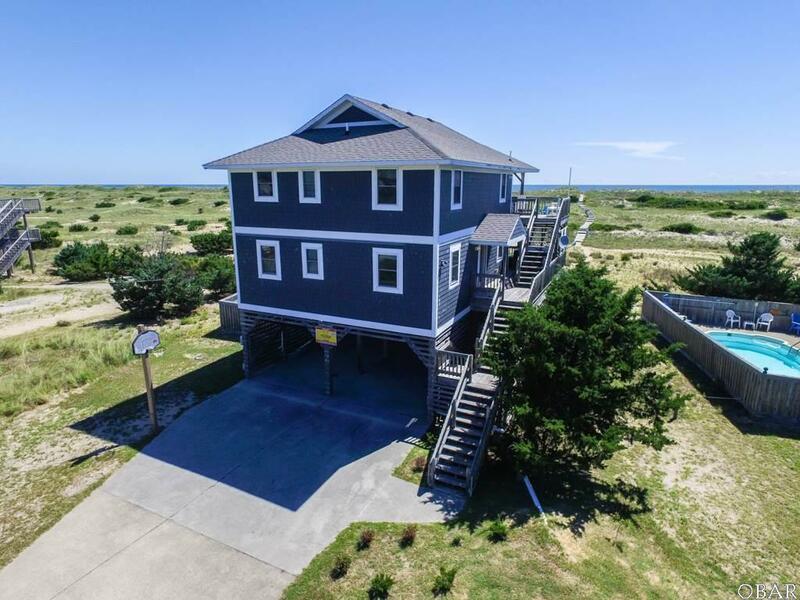 Check out this beautiful, 4-bedroom oceanfront home nestled into a quiet and family-friendly cul-de-sac on the spacious beach of Salvo. With uninterrupted ocean views, private heated pool, hot tub, and convenient backyard boardwalk to the beach, you are sure to fall in love with this perfect second home or rental investment property. "Almost Home" has all the amenities of home presented within a bright and cheerful interior. Featuring a reverse floor plan with an open and spacious living area, fully equipped kitchen with counter-height bar seating, and a large dining area with space for 8 people--this home is made to entertain. With direct access to the covered deck overlooking the beach, you will never be far from those pristine ocean views. Lower-level living areas include three queen bedrooms, two of which also have access to covered oceanfront decks and hot tub. Beneath the home, space for two cars to park under is provided, as well as a spacious outdoor shower--perfect for a rinse after a long day at the beach or before hopping into the adjacent pool. Exterior access to both levels of the home can be found leading from the driveway and parking area. With local area attractions such as beach driving ramps, world-class kiteboarding, and Cape Hatteras Lighthouse, entertainment is at your fingertips. Don't let this opportunity pass you by, inquire today! !